Culver City, CA, November 20, 2017 –(PR.com)– During this occasion over 100 independent films will be screened in celebration of Culver City's Centenary. The festival director Culver City Film Festival, Jon Gursha has announced that the fourth annual Culver City Film Festival will be held at Cinemark 18 and XD Howard Hughes Center, starting from Tuesday the 5th to Monday the 11th of December 2017. The Culver City Film Festival is an annual celebration specifically designed with the primary aim of bringing together a diverse group of filmmakers to share recent works and recognize local talent in a city celebrated for its cinematic history and in-depth cultural values. Submissions are now open for filmmakers around the globe to submit their short and feature films both narratives and documentary. A team of professional and highly experienced screeners has been selected to screen all the submitted films in accordance with the standards established by the organizers of the film festival. During the film festival different awards have been earmarked to be won ranging from; best family film, best international film, to best production design, best ensemble cast, audience award documentary, best short screenplay, best comedy feature, best short comedy and many more. 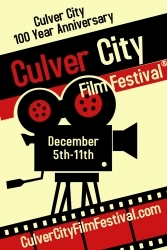 “Filmmakers all over the world are reminded to use the FilmFreeway https://filmfreeway.com/CulverCityFilmFestival for submission of their films for screening, as this remains the best way to submit their films for the Culver City Film Festival,” stated Jon Gursha. “We accept all submissions from around the world of short and feature films both narratives and documentary but films in languages other than English must be subtitled in English language for easy understanding.” The Festival is also accepting submissions with Stellar Lumens XLM crypto currency. To submit your film with XLM Stellar Lumens contact Jon Gursha via the Culver City Film Festival website. During this unique and ground-breaking festival, celebrations will also be carried out to mark the centenary (100th) year of Culver City and its film production. The organizers and partners of this exceptional festival will celebrate it along with the 100 years anniversary of Culver City. The Culver City Film Festival kick-off party will be held on Sunday, December 3rd from 7pm to 10pm at Rush Street bar and restaurant in Downtown Culver City. Come an hour early to enjoy an Actor’s Workshop to include panelists Stan Harrington, Kym Jackson, Michelle Lukes, Karina Matas Piper, Hoyt Richards and the Filmmakers of Trouble is my Business. To be hosted by Kirk Ride from 6PM to 7PM. Kirk Ride’s credits include the following films: True Nightmares, Rope Trick, Escape Artist, Fortune Defies Death and A Singularity. Rush Street is located at 9546 Washington Blvd, Culver City. The Awards show and ceremony will be held at Gravlax in Culver City on December 11TH from 7PM to 10PM. The Awards ceremony will be the best of the fest and will include prominent Actors, Directors and Producers of the festival. Gravlax is located on the corner of Washington and Centinela Ave. 12400 W. Washington Blvd, Culver City. Culver City Film Festival was founded by Jon Gursha and Peter Greene and is a registered trademark of Jon Gursha.